With summer just weeks away, Cincinnati Recreation Commission leaders assured city leaders on Tuesday that no pools would close, despite budget woes from years of neglected maintenance. The bad news: There will be no extended recreation center hours or evening swim hours this summer. Recreation leaders briefed Cincinnati City Council’s Education, Innovation and Growth Committee on the $97 million of repair issues facing city pools, recreation centers, basketball and tennis courts. “It’s across the board - it’s roofing, it’s the internal mechanics of the buildings, it’s pools,” said CRC director Daniel Betts. In March, WCPO’s I-Team investigated the city’s recreation centers and found them in a ‘crisis situation’ after years of neglect. Betts and Councilman P.G. Sittenfeld both credited WCPO for bringing the situation into the public eye. But there is no easy solution. Especially as city leaders face a growing budget deficit now predicted at $29 million to $34 million. “If you’re pitting rec against firefighters or police officers … it’s a challenging equation,” Sittenfeld said of the upcoming budget negotiations in a few weeks. Councilman David Mann asked Betts for a list prioritizing capital needs. The city has steadily cut funding to the recreation commission for at least a decade. As summer approaches, more than half of the city’s pools – or 53 percent – are past their lifespan. A sinkhole at Lang Tennis Courts in Kennedy Heights is at least 10 feet wide and several feet deep. It cannot reopen as a tennis court because of a deep collapsed sewer underneath. Several basketball courts are in such bad shape that city engineers may have to close them if they become unsafe. The CRC’s repair fund is drained quickly because 45 percent of outdoor recreation facilities and 40 percent of athletic facilities are out of lifespan. 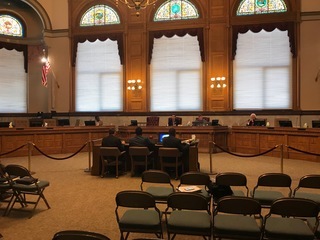 Betts told WCPO in March that he plans to ask city council for $30 million in next year’s budget to cover critical capital needs – repairing recreation center roofs, upgrading electrical systems to meet code, fixing pool leaks and resurfacing tennis and basketball courts. Cincinnati Recreation Commission Director Daniel Betts updates city council on $97 million in maintenance needs for the city's pools and recreation centers. But finding that money within the city’s existing budget could be an impossible challenge. Instead council members talked about finding a separate stream of cash to devote to recreation. Ideas included: a recreation levy on the ballot, having the city issue bond debt, or capping tax abatements in certain areas of town and using that savings for recreation. Betts said he is considering a levy that would fund capital projects for city parks and recreation. In the meantime, the city may have to close some recreation centers, Betts said. While residents may want a recreation center in their neighborhood, “I’m not sure if that’s sustainable moving forward,” Betts said. Councilman Wendell Young asked if some newer city pool facilities could stay open later this summer. “It gets really hot and a lot of people still don’t have air conditioning … kids being able to swim a little later at night could be a real relief,” Young said. Most of the city’s recreation centers are closed on weekends, including many in disadvantaged neighborhoods such as West Price Hill, Millvale, Winton Hills, West End and Bond Hill. Sittenfeld asked the city manager’s office for a list of possible ways to increase funding for recreation. He also wants a list of recreation centers that have the biggest repair needs. But that may not matter in the heat of budget negotiations. Seelbach also took a dig at his colleagues for supporting the FC Cincinnati stadium deal. On April 16, council approved a $34.8 million stadium infrastructure package – including parking, utility lines and site preparation for a $200 million soccer facility in the West End. “I will say with all due respect to my colleagues, we could have paid for 10 percent of this $90 million (in CRC capital needs) if we didn’t give billionaires $40 million dollars in city tax revenue,” Seelbach said.